50 years ago on this day, the group of men fondly known as the “Big Six” marched arm in arm with hundreds of thousands of civil rights activists and supporters from the Washington Monument to the Lincoln Memorial on August 28, 1963. 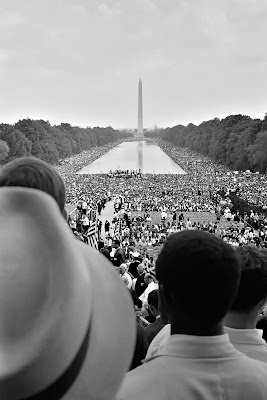 Armed with the courage, faith, and perseverance of Dr. Martin Luther King, Jr., Roy Wilkins, Congressman John Lewis, Asa Phillip Randolph, Whitney Young, and James Farmer, Jr., over 200,000 individuals were led through the Washington Mall and stood unified to send a resounding message demanding the end of civil and economic discrimination. During preparations of the March on Washington rally, organizers were harassed repeatedly, often receiving death threats to cease their actions. However, civil rights leaders everywhere did not waver and continued to move forward. Through their efforts the civil rights movement in America galvanized people everywhere to support the cause that every man, woman, and child deserved the same unalienable rights that the constitution guarantees. 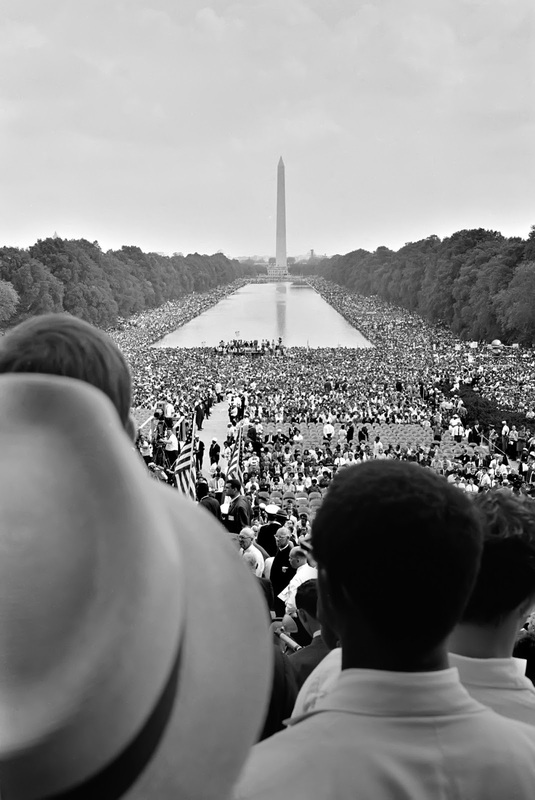 Dr. Martin Luther King, Jr.’s “I have a Dream” speech is often revered as the highlight of that historic march. His speech still sparks inspiration, provides hope, and infuses courage to those who read those remarkable words and dares to dream. Dr. King and the other members of the “Big Six” stood up to intolerance and racial injustice in America, and worked tirelessly to spread their message of equality for all utilizing nonviolent protests. Through their efforts, and the efforts of countless others, the United States of America was led down a better path and has become a better and stronger nation. Less than a year later the Civil Rights Act of 1964 was passed. Sadly Medgar Evers, Rev. George Lee, Herbert Lee, William Lewis Moore, and many other civil rights activists were killed prior to its passage. Posted below is the actual text of Dr. King’s “I have a Dream” speech. BOSTON— House Minority Leader Bradley H. Jones, Jr. (R-North Reading) and Senate Minority Leader Bruce E. Tarr (R-Gloucester), along with the entire House and Senate Republican Caucus, today announced the launch of the 2013 GOP Technology Tax Business Roundtables. In today’s Gloucester Daily Times, the newspaper cites and endorses legislation that I filed in January that would create more oversight of the state’s forensic crime labs. Senate Bill 1175, An Act providing oversight of crime labs, was filed in response to the alleged actions of forensic crime lab chemist Annie Dookhan, which revealed that proper safeguards need to be in place to ensure a system of integrity. Please click here to read today’s editorial. “The fallout of the egregious actions of forensic crime lab chemist Annie Dookhan directly correlates with the lack of oversight of the state’s forensic drug labs. In January I filed legislation that would instill the necessary oversight, accountability, and transparency needed to ensure a system that demands integrity. -Facility employee records, qualifications, and incident reports. • The timely reporting of suspected or potential criminal wrongdoing to the Attorney General for investigation and prosecution. * Click here to read the text of the bill. Recently Bailee Militello, a 7-year-old girl from Gloucester, North Shore 104.9FM, Action, Inc., the organizers of the Gloucester Block Party, and I partnered to collect school supplies for needy Gloucester elementary and middle school children. Stationed at the August 17th Gloucester Block Party will be a table for collections near the entrance of CVS on Main St.
To review what supplies are most needed please read the posted flier. For additional information please play the below video that was created by Lisa Smith at Cape Ann TV or click here to visit Action, Inc.'s website. On Wednesday evening the members of the Senate Republican Caucus were guests on NECN’s “Broadside” with special guest host Joe Battenfeld. We discussed with Joe the recent departure of State Senator Michael Knapik and what that means for the minority party in the Senate and Massachusetts. To watch Wednesday’s segment please play the first posted video below. Additionally, during today’s Fox 25 Morning News, Co-Anchor Gene Lavanchy and I discussed the meetings currently being held in the City of Boston this week by the Republican National Committee, and the direction Massachusetts needs to take to create more balance within state government. To watch today’s Fox 25 segment please play the second video posted below. Tomorrow morning I will be a featured guest on the Fox 25 morning news. I will be speaking with Co-Anchor Gene Lavanchy regarding the Republican National Committee meetings being held in Boston this week. Please tune in at 7:45am to watch tomorrow’s interview. This evening the Senate Republican Caucus will be guests on NECN’s Broadside, where we will be discussing the current state of the Massachusetts Senate and the need for balance and different perspectives. Please tune in at 6:00pm to watch what will surely be a lively discussion. On Sunday, August 4th I once again had the opportunity to participate in Newburyport’s Annual Yankee Homecoming Parade. The city’s Yankee Homecoming, which was originally started by Newburyport native George Cashman in 1958, is the second oldest homecoming festival in the United States and just celebrated its 57th year. The Yankee Homecoming provided many events that brought out thousands of people during the weeklong festival that was capped off with the parade, which featured bands, floats, marchers, and others. Energy, excitement, and community pride were on full display. Congratulations to everyone who worked diligently to make this year’s homecoming another successful one. It was a real pleasure to be a part of the parade. To learn more about Newburyport’s Yankee Homecoming please click here to visit the festival’s Facebook page. On Tuesday, August 6th I had the opportunity to once again participate in North Andover’s National Night Out event at the Middle School. The free-of-charge event sponsored by the North Andover Police Department and community group Neighborhood Watch was extremely well attended. Featured were music, games for children, face painting, good food, local businesses showcasing their goods/services, and more. Most importantly, people had the opportunity to collect information regarding crime prevention. Nationwide over 36 million people in 15,000 different communities from all fifty states attend a National Night Out event within their community. The first event took place on August 7, 1984 and has now enjoyed its 30th annual “Night Out”. Through the commitment of law enforcement personnel, crime watch volunteers, and dedicated individuals, events such as these provide a great opportunity for people to meet their local law enforcement officers, and receive invaluable public safety information. I want to thank everybody who made this event such a success. They include Police Chief Gallagher and the North Andover Police Department, active citizen Debbie Savoia and the North Andover Neighborhood Watch Organization, the North Andover Fire Department, the Recreation Department, and many others. Posted below are several photos from Tuesday’s event. Today the Legislature’s Joint Committee on Public Safety and Homeland Security is conducting a public hearing on legislation relative to guns at the Wilmington High School from 10:00AM-5:00PM. The committee is soliciting testimony for approximately 60 bills that focus on the licensing, possession and sale of guns, gun safety, and other related issues. With the Joint Committee on Public Safety and Homeland Security stepping out of the State House to conduct such hearings, citizens are provided a great opportunity to get involved with the legislative process to provide their thoughts on the laws that impact them daily. To view the bills being heard today please click here. 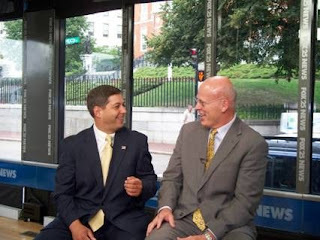 Tomorrow morning I will once again be analyzing political issues with former State Senator Warren Tolman on the Fox 25 Morning News segment “Tolman and Gray”. Warren and I will be discussing potential ballot questions, the upcoming race for governor, and the gas tax. Please tune in to Fox 25 at approximately 7:45am to watch our lively conversation. During this past Sunday’s airing of WBZ-TV’s Keller@Large segment, I sat down with political reporter Jon Keller to discuss the very serious repercussions of the passage of a transportation finance bill that creates a computer services tax and authorizes regular increases to the gas tax. It’s unfortunate that this path has been chosen to fund improvements to our transportation infrastructure. The consequences of these taxes will hurt families, small businesses, and hamper an already delicate economy that is still in the midst of uncertainty. To watch Sunday’s segment please play the posted video below. 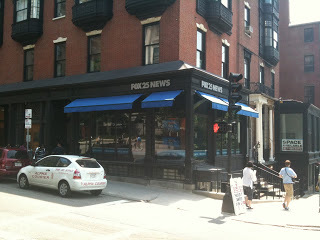 This Sunday at approximately 8:30am I will be a guest during Reporter Jon Keller’s Keller@Large Report on WBZ-TV. Jon and I will be discussing a recently passed transportation financing bill that creates a new computer services tax and raises the gas tax. Please tune in Sunday morning to watch our lively discussion.